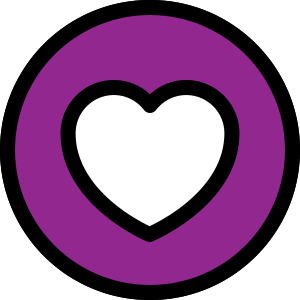 Hello again, everyone! Today, I'd like to talk about Kerrigan. The Queen of Blades was reworked on September 4, 2018, and has so far seen use in the HGC Finals at Blizzcon. I'd like to take a look at this hero's standing so far in professional play, including some head-to-head matchups and heroes that have paired well with them. Keep in mind that, as is always true of HGC games, some of this data will be skewed due to the differences in skill between teams. No hero has yet managed to completely overcome a skill deficit between teams or regions. I will try to take this into account in my writings. 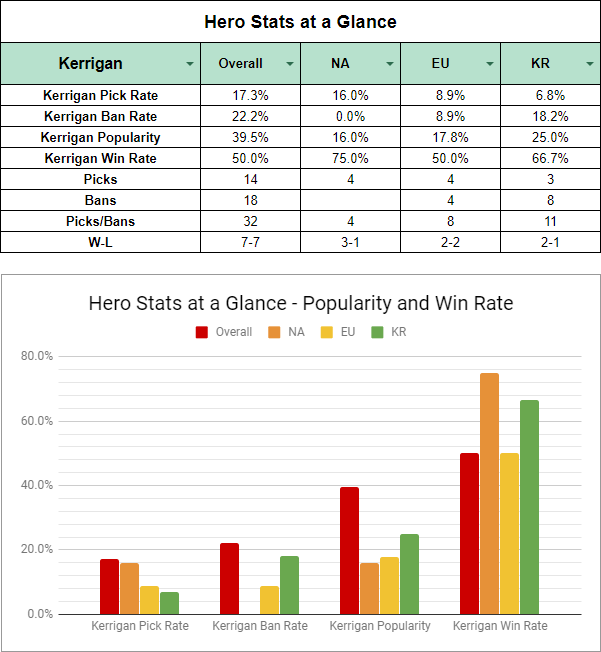 Kerrigan found her way into nearly 40% of all the games at Blizzcon as a pick or ban, with 14 picks and 18 bans. She saw the most play with North America and Europe (at four games each), and the most bans from Korea (at eight bans). As a result, her popularity was highest in Korea with 11 total picks and bans. While not shown in the table above, she also saw one pick and one ban from China, as well as 2 total picks and 5 total bans from minor region teams. None of the regions really saw enough action on their own to judge the accuracy of her win rates. None of these teams had enough time to really showcase the hero for the purposes of win rate analysis, but we can see some interesting details nonetheless. For example, when Tempo Storm ran Kerrigan, they only allowed Fan "Fan" Yang to use her, and ended up with a 2-1 record on her, which is measurably better than their overall 4-8 game record at Blizzcon. By contrast, Dignitas went 0-2 on the hero despite a fairly strong 15-4 overall game record, with Joshua "Snitch" Bennett and Jonathan "Wubby" Gunnarsson each playing her once. And as you can see, Gen.G didn't play her at all, and won Blizzcon in convincing fashion. So for once, the hero's successful games didn't actually correlate with the more successful teams, which is an interesting tidbit, although we ought not to draw too many conclusions from it. 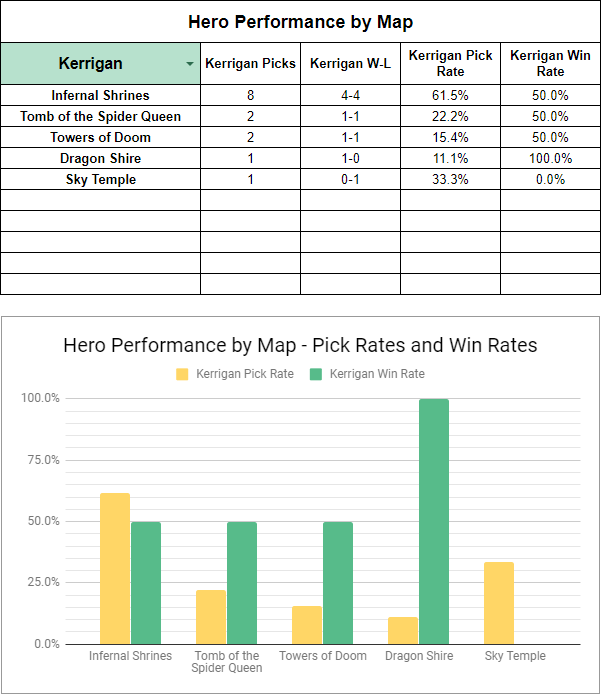 Despite attempts to shift her map priorities and expand upon where she's used, Kerrigan remained primarily an Infernal Shrines pick, with more games played on that map than every other map combined. However, the fact that she still showed up on other maps that she often wasn't usually picked on, even if it was only once or twice, is still a positive sign for the most part. In terms of draft style, Kerrigan was frequently picked for two things: raw damage and wave-clear. We see her being drafted in both a flex and offlaner position, usually alongside a second source of damage and/or a second source of reliable crowd control to capitalize on her combos. 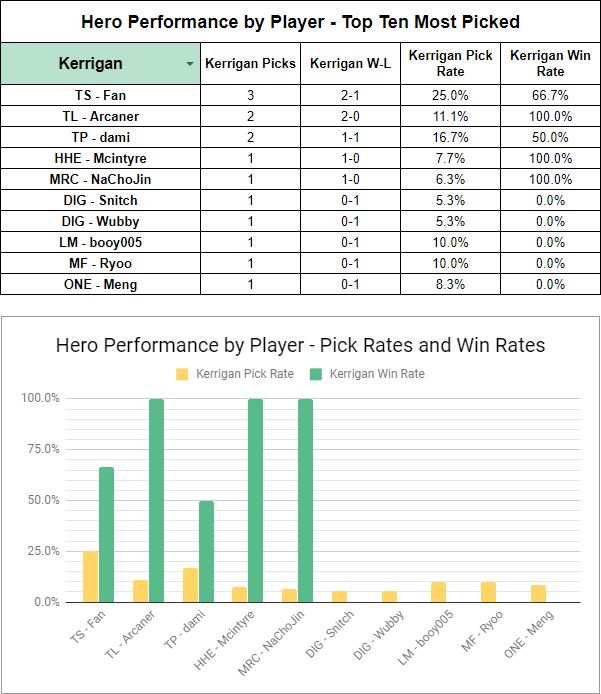 About 47% of Kerrigan's involvement in the draft comes in the first two sets of bans, with about a 78% involvement rate prior to the second half of the draft. 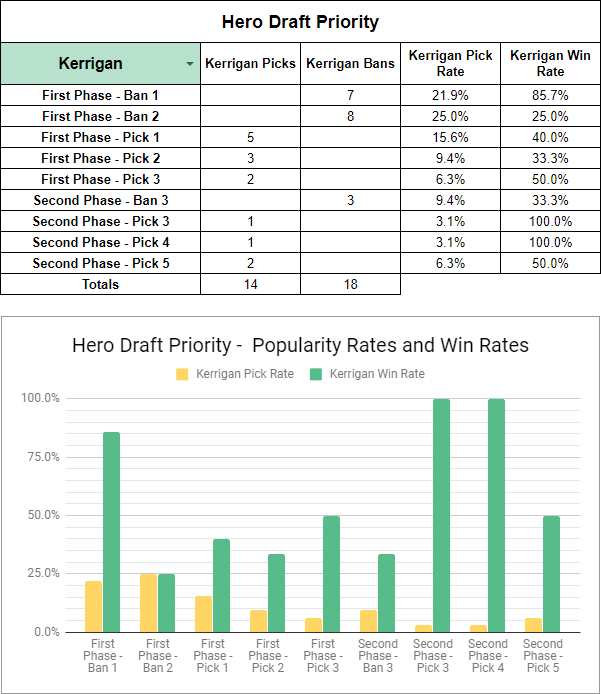 Previously, Kerrigan was most typically a pick in the four-five slots of a draft as a "surprise" pick, so this represents a pretty decent shift in her priority over her prior incarnation. This could indicate a greater level of confidence in her relative strength. Given that only 4 of her bans were on Infernal Shrines, this also suggests that it's not merely being trotted out as a "safety" ban on maps where she's typically played, but in fact might be a legitimate "respect" ban to restrict her use on other maps. While the statistical significance of many of these results is lacking, there are still some pretty obvious conclusions to be drawn from the results. For example, Kerrigan's lengthy stun is an excellent set-up into a crowd control chain, which means that heroes like Tyrande, Malfurion, Blaze, and Anub'arak are natural fits as her companions since all of them provide considerable stuns and roots on their own, and all of them are much easier to land following a Kerrigan combo stun. Kerrigan saw use with a variety of heroes acting as another source of damage to help provide finishing power, including some AA heroes (Raynor and Fenix) and some mages (Gul'dan and Jaina). Kerrigan's reliance on melee combat, however, leaves her vulnerable to heroes that can restrict her mobility with slows or harder forms of crowd control. Arthas is still a pretty natural counter to her with natural melee slows and roots, and Deckard Cain's roots are also functional enough for the job. Yrel also provides an ample slows that can restrict Kerrigan's ability to escape from a bad situation. 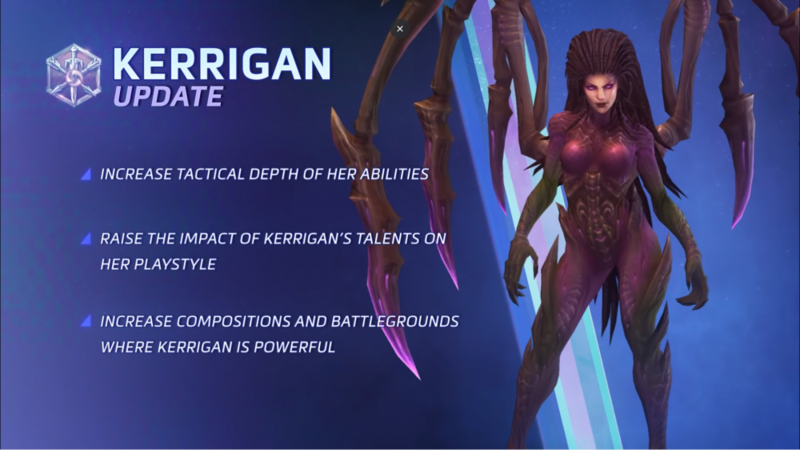 And of course, it helps if you combo these with a good source of poke, since Kerrigan's entire design relies heavily on melee combat and doesn't give her many tools to close a gap once she's expended Ravage. Common choices are Hanzo or Raynor, although the latter likely has a bit more of an edge due to his ability to better sustain himself against Kerrigan, whereas Hanzo's lower health and lack of sustain makes him easier pickings. 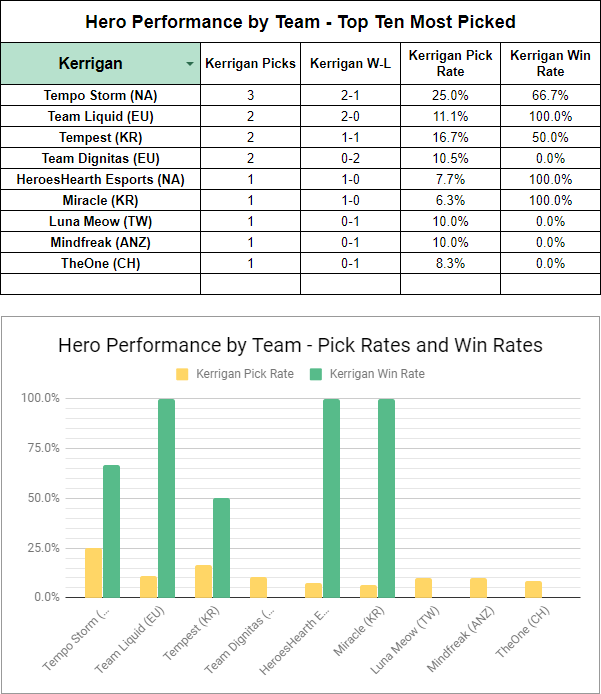 Kerrigan has seen a number of picks and bans, though she is not dominating the meta as other assassins have, so her position seems to be pretty healthy. Kerrigan has proven to still be a fairly useful tool on Infernal Shrines, though indications suggest that she has expanded a little bit to other maps as well. The rework has successfully altered her priority, pushing her into more of a confidence pick in the earlier draft stages as opposed to just being a niche "surprise" pick in the last slots of the draft. Try to pick her into a composition that takes advantage of her stun combo with additional crowd control followups, and try to keep her out of situations where she can be rooted and poked away from a safe distance. Looking for more of my work? My last HGC article focuses on Mephisto, the newest mage to enter the Nexus. That article is located here. Feel free to let me know your thoughts to this article in the comments section below, or on Twitter at my handle @CriticKitten. I look forward to your replies!